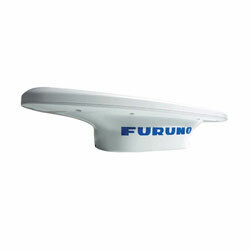 Furuno SC33 Compact Dome Satellite Compass, NMEA2000 (0.4° Heading Accuracy) with 19' 8" (6 meter) Cable: The SC33 Satellite Compass provides highly accurate attitude information for navigation equipment such as radar, plotter, autopilot, fish finder and sonar. With its compact GNSS antenna and built-in processor, it can be used for a wide variety of applications on any type of vessel. This all-in-one system delivers incredibly accurate heading and roll & pitch information as well as heaving information, GPS position, SOG (speed over ground), COG (course over ground) and ROT (rate of turn) data. The GNSS antenna and advanced parallel signal processing allows the SC33 to achieve more precise pitch, roll and heading measurement than conventional models, providing enhanced performance for all of your connected equipment. Its Micro-C pigtail NMEA2000 cable provides flexibility to run cables in challenging areas. Revolutionary 2-Antenna & Rate Sensor System: In order to calculate roll & pitch data, a satellite compass requires two vectors. The SC33 employs a dual GNSS antenna system that calculates a single vector while a 3-axis rate gyro and acceleration sensors add the 2nd vector. This configuration enables the SC33 to calculate highly accurate roll and pitch data without using a third sensor. Employing a two-antenna system with a 3-axis gyro and acceleration sensors, the SC33 enables high-speed response capability. Advanced digital signal processing techniques compute accurate heading based on sensor data. NMEA2000 interface is standard for simple installation, while the optional interface unit (IF-NMEASC - sold separately) is available for conventional NMEA0183, AD10 and contact closure. Perfect heading sensor for radar/TT, AIS, scanning sonar, etc.